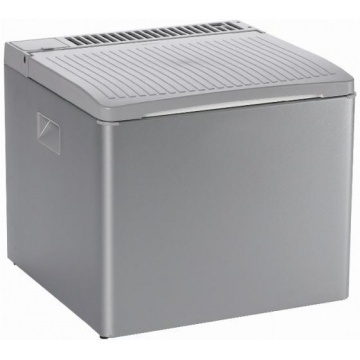 Dometic Combicool RC1700 gas camping fridge, a more powerful portable 3 way 12 V, electric and gas fridge than the standard Combicool RC1200 that is ideally suited to camping in the UK and Southern Europe. 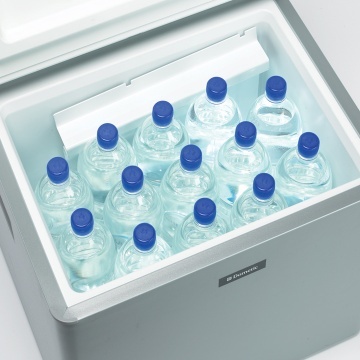 Powerful cooling keeps fridge temperature even when up to 36°C outside. 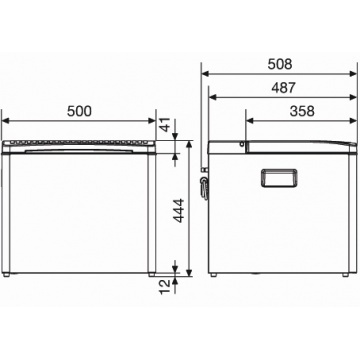 Family size storage capacity of 40 litres. 3 way power options 12 volt in the car, standard mains electric or gas operation. Manual control valve for gas use. Built in piezo spark gas igniter. Low gas usage, 7 kg calor gas lasts 30 days. Stores standing 2 litre bottles upright. Convenient embedded side carry handles. Attractive silver coloured casing and lid. Manufactured to high standard in Europe. Supplied with handy ice cube tray. Easy to transport weighs just 16 kg. 12 volt and mains electric leads supplied.